Part rogue-like, part resource management, part twin stick shooter, and a whole lot of fun basically sums up Airheart: Tales of Broken Wings. It has a simple gameplay concept that gets interesting once you get the hang of it. Round the game out with an interesting view and nice graphics and you have a formula that is quite satisfying. Underneath it all is some heart and charm thanks to its influence from Emilia Earhart herself. The game even released on her birthday. Happy 121st! You play as Amelia, a young pilot who has escaped the troubles of earth to live in the sky and try to make a living by fishing for sky fish (literally fish the “swim” in the sky) and ultimately, to find the fabled Sky Whale. But of course, not everything is as easy as you might hope. You’ll soon discover that pirates are going to give you all kinds of trouble. Especially as you fly higher up. 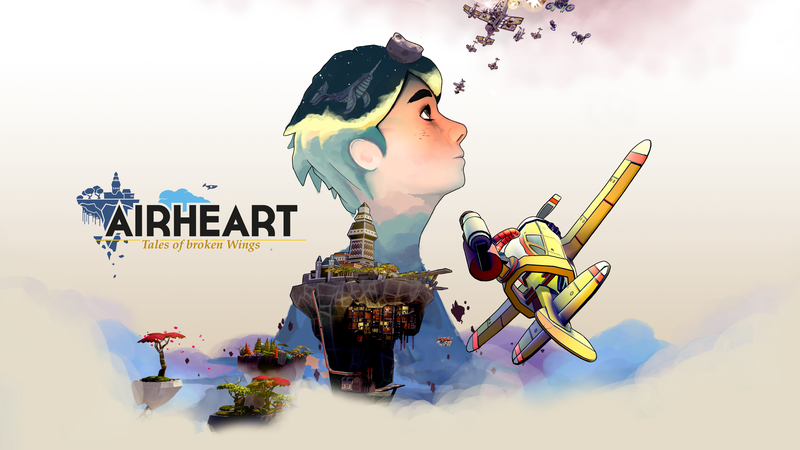 The main draw for Airheart is the layout of the world. It’s a bit like a dungeon in reverse. Instead of going down levels you are go up. Each level tasks you with catching fish and defeating pirates, which are flying their own planes and waste no time in trying to take you down. As you clear each level a path way opens up that shoots you straight up into the next level. The really neat effect here is that you can look down and see all the levels below you. You can see the earth below and previous levels. You might even spot your base of operations down there. Granaria is your home base in Airheart and is where your adventure begins for each playthrough. Here you will upgrade your plane with resources and money you earned from fishing. In the hangar you’ll have the chance to buy and collect different kinds of parts for your plane. You can buy variations of the chassis, engine, and wings. Some change how your plane flies. Others give you different types of weapons. They all can vary the gameplay quite a bit, so experimenting is key and part of the fun. Eventually you can have a lot of different combinations and make interesting planes that also suit your play style. You’ll quickly discover that buying parts is pretty expensive though. In fact, I might even go as far as to say too expensive. It takes quite a bit of money (aka time) to purchase parts. You have to do a lot of fishing to make the money to just buy one part. As you get further in the game you’ll earn more money but it still can take some time. On top of that you have a chance of losing parts when you get shot down. As you gather resources and earn money you’ll be able buy more parts for your plane. At the Workbench you can experiment with various resources gathered from your flights above. You can create all kinds of different items and parts here but first you have to figure out the formula. This is where experimentation also comes in. You’ll have to try different combinations of resources to figure out the blueprints. Once you have them unlocked you can buy the parts at a smaller cost. Figuring out the combinations takes a lot of trial and error. As you add in ingredients and try it, the game will tell you if it failed or not and give you a hint as to which ingredients are in the right place. You can also take airplane parts and try to get the blueprint from them in order to buy them again at a smaller price. The only problem is that the chance of getting the blueprint is pretty small and you’ll lose the part. But if you do get the blueprint, it’s a much cheaper and effective way to make parts. The Workbench is almost like a different game in itself when you get in-depth with it. It has a fun risk/reward aspect to it that ties in nicely with the rest of the game. The controls in Airheart take some getting used to. When you first start flying you’ll likely be running into rocks and bullets on a regular basis. Controls can be a bit clunky but I did get used to it fairly quickly. It also depends on what parts are on the plane. Different parts can change how your plane handles. I had a rough start but it didn’t take me long to get used to the controls and I suspect it will be the same for most people. After getting the hang of it, flying became second nature. In true twin stick shooter fashion, the right stick is used to aim your weapon and R2 to shoot. Landing hits can be troublesome though. The reticule stays pretty close to the plane, so it’s not always a sure bet that you will hit something from a distance. Throw in the fact that you and the enemy are always moving and things get chaotic pretty quick. You don’t really have to worry about ammo though so it works out and ends up being a lot of fun. Basically, learn to dodge and fire into their flight path at the same time to succeed. When you get low on health the game will give you a warning to head back home. This is your last chance to make your way back to Granaria and save the loot you have collected so far. If you lose all your health you’ll have to crash-land back down to Granaria. As you’re falling through the sky you’ll have to dodge islands from previous levels and try to aim for home base. If you make it in one piece you’ll still live but you’ll lose parts of your plane. Crashing before making it back home destroys the plane and Amelia and causes you to lose everything. All of it. This threat of permadeath gives the game some tense moments but if you’re careful and drop back home often you’ll mostly bypass this death. The only downfall to this gameplay loop is the game can get fairly repetitive. Every time you either crash or fly back down to your base you have to start over from the beginning. You have to make your way back up to where you were and try to get a little further along. Unfortunately this might be a bit of a turn off for some players as they may not give it a chance after playing through the early levels so many times before they really get the hang of it. Look at All the Planes! The graphics in Airheart are easy on the eyes. The design of everything has a solid feel to them and it makes the game pretty snappy. The planes themselves are pretty neat to look at when you get the chance. It was also satisfying seeing how Amelia’s plane changed as I changed out different parts. I also enjoyed flying through trees. Shooting out the other side in a flurry of leaves was fun. Plus they sometimes held secrets. The music is pretty entertaining. Lower levels have a bit of a western vibe to them while higher levels tended to sound a little more on the futuristic side. The only issue I had is that there isn’t a lot of variety and it doesn’t take long for songs to be heard several times. Especially the earlier ones. All in all Airheart was very satisfying. Flying my plane around collecting fish and shooting down pirates is a lot of fun. I enjoyed how when you’re shot down you have a chance to save yourself with the threat of permadeath hanging over your head. Experimenting in the workbench is interesting and trying different plane parts can change how you play the game. At the end of the day if you’re looking for a rogue-like that has a lot of charm and stands out from the crowd, you can’t go wrong with Airheart: Tales of Broken Wings.